Today’s card, the Three of Staffs from the Alchemical Tarot, is all about preparation, expectation and anticipation — and pretty much in that order. This is the “nothing ventured, nothing gained” card, especially with respect to your long-term goals. It’s not about standing on the sidelines and waiting for your ship come in. It’s about laying the groundwork for an important project or venture, and the satisfaction that comes with seeing initial results. 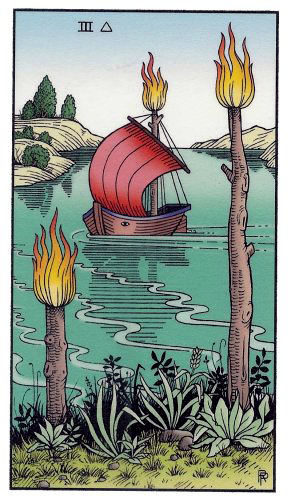 The Three of Staffs — Wands in some decks — speaks of sailing off toward new horizons and moving away from what has felt comfortable and routine. It involves taking risks and being willing to put yourself on the line — knowing with every fiber of you’re being that you’re headed in the right direction. If you look at the imagery in this version of the card, you can see that it’s not going to be all smooth sailing. You may come upon some choppy waters which will either propel you forward or cause you to capsize. But this small boat is sturdy and seems to have no problem navigating toward its destination. Notice the red sail — action, energy, movement — and the small “eye” on the hull. Also note that one of the three staffs serves as a mast, reminding us that the boat couldn’t sail without it (or you). You won’t be able to just stand back and watch it sail. The Three of Staffs says that you’re a part of the process and that your ultimate success (or failure) is almost entirely in your hands. As you move toward your destination consider the other two Staffs standing as beacons on the shoreline. The fertile shores suggest that you’re moving toward greener pastures. And the Staffs themselves — in three different sizes — remind you that success comes in stages and each small step moves you closer to realizing your goals. Today’s card — Three of Staffs — comes from the Alchemical Tarot Renewed by author/artist Robert M Place, published by Hermes Publications through the Alchemical Egg. This deck is also available as an Iphone, Ipod and Ipad app through Itunes. Please visit and “like” the deck’s Facebook Fan page.